Sam Glanzman, a prolific comic book artist most famous for his war stories, wrote and illustrated two graphic novels entitled A Sailor's Story about his experiences aboard the destroyer U.S.S. Stevens (DD-479) from early 1943 to late 1945. Between 1970 and 1977, he wrote and illustrated 65 comic stories of four to five pages each about the wartime adventures of Stevens. The time period during WWII covered by the two graphic novels overlaps, but each book has different stories and can be read apart from the other one. Only Book Two covers Japan's kamikaze attacks with a four-page section at the beginning and another four-page section at the end. These sections, which focus on the Battle of Okinawa, do not mention Stevens since the destroyer only had contact with kamikazes while serving in the Philippines. 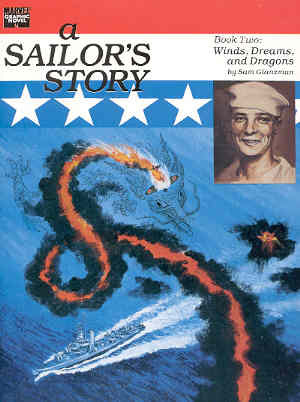 Possibly the publisher encouraged the author to include these sections in order to broaden the appeal of the book, since many U.S. Navy veterans had faced kamikaze attacks. A Sailor's Story contains various personal stories about Stevens' crew with an effective mixture of seriousness and humor. For example, Buck is portrayed as an eccentric character who would crow each morning after climbing to the top of the forward stack and would think some Japanese spy was on board disguised as a seaman. However, after he appeared to have gone over the edge when trying to lop off someone's head with a long knife, the Captain transferred him to a hospital ship to get a medical discharge. The author portrays Buck in a sympathetic manner with the explanation that he had served eight years in the Navy and had been trapped in the capsized Oklahoma for 14 hours when the battleship had been sunk during Japan's attack on Pearl Harbor. In addition to depicting individual Stevens' crewmen, Glanzman uses his stories to explain the destroyer's layout, including her armament, and the wartime functions of the ship. A two-page detailed cutaway side view of Stevens clearly shows locations of the ship's main compartments and guns. The author explains in a natural way the Navy jargon used by the crew. Overall, these two graphic novels provide a real education about a WWII destroyer. The first graphic novel, published in 1987, covers the period from December 1942 when Glanzman left home to join the Navy to November 1945 when he returned home to find out that his beloved black Labrador named Beauty had died while he had been away. This book does not try to be a chronological history of Stevens, and the period after December 1944 has few details regarding the destroyer's actions other than a long list of places visited. Stevens' deck originally had a float plane that could be catapulted off and then recovered after landing next to the destroyer. The crewmen hated the scout plane that had been installed as a Navy experiment, and they were glad when the plane and catapult soon were removed and replaced with additional armament typical of other destroyers. Book Two begins in late 1943 and continues on to August 1945. Starting in February 1944, this graphic novel has a monthly Travel Log of U.S.S. Stevens to summarize the ship's actions and movements. These Travel Logs do not detract from the personal stories about crewmen who remain the focus of Glanzman's writing. Stevens' most intense battle action took place on the way to Lingayen Gulf on January 12, 1945, when the destroyer's gunners shot down four attacking Japanese aircraft. 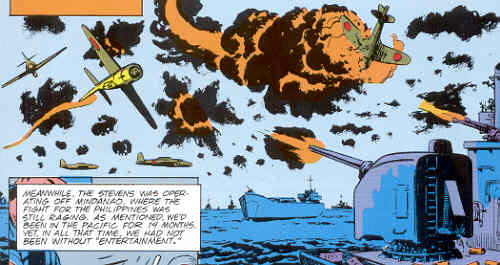 The comic depicts in four successive frames how on that date Stevens destroyed two twin-engine bombers, a Tojo fighter, and a Judy dive bomber. … lost April 6th: U.S.S. Bush with 87 men dead. 5-inch thunderbolts and steady firehose streams of white-hot tracers were pumped into the attacking planes. For two days they had swarmed over the ship. On the third day, just 30 feet above the water, a Kamikaze rushed in with the speed of a locomotive. It smashed into the ship's starboard side between stacks no. 1 and 2. The explosion hurled a 4,000 pound section of the engine room's blower 50 feet into the air. A second suicider hit, nearly cutting the ship in half. Topside bluejackets died in the inferno; below decks, others died drowning in the inrushing waters. In agony the ship struggled to remain afloat. A third plane plummeted in, erupting with a crimson flash . . . ending the agony. Wallowing in flood water and flame, the ship broke apart and sank. The two volumes of A Sailor's Story realistically portray life aboard a destroyer during WWII. Sam Glanzman's first-rate comic drawings and engaging text vividly depict the lives of U.S.S. Stevens' crewmen and various events, whether heroic, humorous, or embarrassing, that they experienced.